Thanks to the FLoA (First Lady of Amarillo), Beth Duke of Center City, for popping up like a prairie dog today on High Plains Morning to remind us that the ribbon cutting for Hodgetown is Thursday, April 5th at 1:00 p.m., and all are welcome to attend. The public is advised to enter through the Buchannan Street entrance. Tours will not be offered at this time, but the Sod Poodles team store will be open during the event. Amarillo Mayor Ginger Nelson and Amarillo Sod Poodles President/General Manager Tony Ensor will be in attendance. 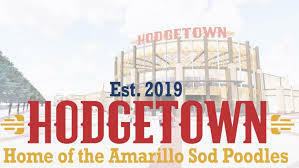 The ballpark is named in honor of former Amarillo mayor Jerry Hodge, and it will begin hosting games on Opening Day, Monday, April 8th. The Amarillo Sod Poodles are the city’s Double-A affiliate of the San Diego Padres. Click to hear Beth’s full interview about this event, as well as more exciting things in store for downtown this summer.